← CCS App comic scanned: Must be touched up a little more. 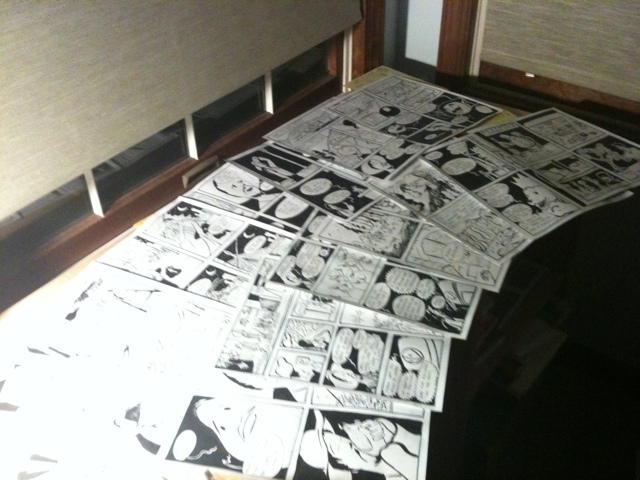 It’s 4 in the morning and I’m finished with the 24 pages of my Center for Cartoon Studies comic. Tomorrow I’ll be working on the computer end of things scanning and retouching. Stay tuned and you’ll find the finished pages in tidy black and white glory. I’m very satisfied with the dialog pacing of this comic in comparison to that of Lionel and the Punks. All in all, I’m pretty proud of this one. Other projects on the way.